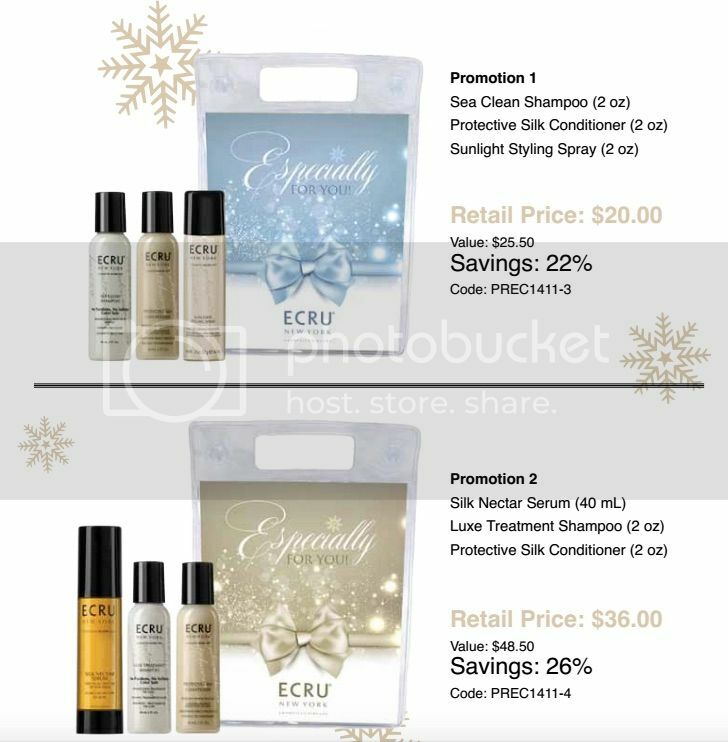 Pammy Blogs Beauty: 'Tis the Season for Giveaways: ECRU Holiday Collection Hair Care Giveaway! 'Tis the Season for Giveaways: ECRU Holiday Collection Hair Care Giveaway! It is time for my next Giveaway! :) This is my 2nd Giveaway from the hair care brand ECRU. I am a fan of the line. So, I am excited to be able to offer these products to you lovely readers through this giveaway opportunity! These ECRU Holiday Gift Sets are great little last minute gifts. Also, they are a really great value. So, if you are curious about the line. They are a great way to scope the line out and try a few products! One Winner will get two Holiday Gift sets from ECRU: the ultra luxurious Sea Clean Holiday Collection and the LUXE Collection. GET LUXE! Collection: This set contains Silk Nectar Serum (40 mL), Luxe Treatment Shampoo (2 oz), Protective Silk Conditioner (2 oz), valued at $36! I'm interested in trying the brand, espcially the Sunlight Styling Spray and the Silk Nectar Serum. These products sound great! I especially want to try the Styling Spray! Because I like to try new products. Thank you Pammy for another great giveaway offer! I've never heard of these of these hair products. They sound like they'd do wonders for my hair. I'd love to win this because it sounds like just the products I need to get my hair in shape especially with this dry and cold weather. i would like to try the protective silk conditioner and the silk nector serum, both would be great for my long hair which is highlighted. I have thick hair and am trying to find the best product for taking care of it. I love hair products and I love to try different products. Hi! I would like to try these products because my hair isn't in the greatest shape with all the cold weather. It'd be nice to try a new quality product. Thank-you for the fun chance!! I would love to win this because I like to try new products. I'm always looking for new and exciting hair care products and this is a brand I've not yet tried.